Daniel Winkler pictured after his arrest in Dumaguete City last November. Since posting bail and going on the run, he has been targeting backpacker hostels across the Philippines, most recently in Boracay. 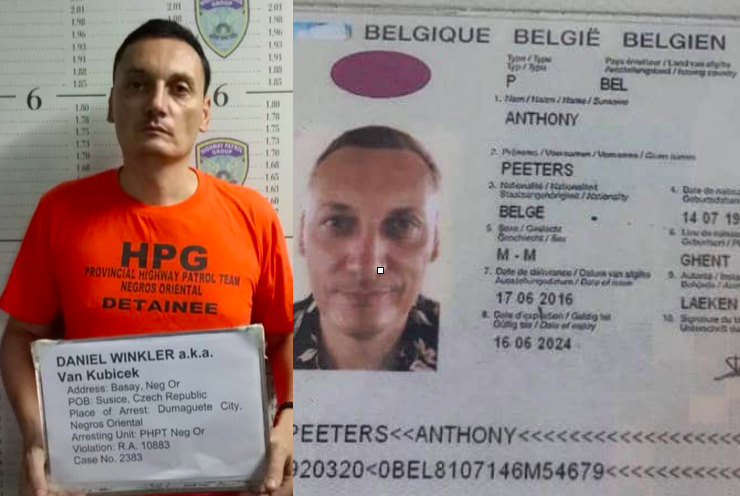 He uses a number of fake identities, including as a Belgian called Anthony Peeters. A Czech man is accused of using multiple fake passports to book backpacker accommodation and steal from fellow guests. The owner of a hostel in Boracay has urged the public and business owners to be on the look out for Daniel Winkler, aged 37, who recently targeted her establishment. Djila Winebrenner of the Lazy Dog bed and breakfast made the appeal on Facebook today (Monday, January 21). She wrote: “This man has been using fake passports, IDs under different names and credit cards to make reservations through Agoda and Booking. com. “He is still at large after recently committing several robberies in Boracay. She also shared a mug shot of Winkler, also known as Van Kubicek, from a previous arrest in Dumaguete City last November. She said that after posting bail he was able to evade police and go on the run. Also attached to the post was a photograph of a Belgian passport in the name of Anthony Peeters. This document, she said, was used on December 8 last year to book into Boracay’s Chillax Flashpackers hostel. However, last Thursday (January 17) he used a French passport in the name of Daniel Dechereu to book into the Lazy Dog Boracay. Anybody who recognises the suspect is urged to contact police or call the Boracay Tourist Assistance Center on (036) 2883035/(036)2883066.